Books are wonderfully old-school in the era of ubiquitous screens, but the lessons they convey aren’t by any means outdated. Here at Bee Talents we are always hunting for people who not only read books, but can actually use them to learn and get better. We prize people who look to books for all kinds of inspiration – as a source of knowledge, as a place to seek a new vision, and even as a source of useful benchmarks. Books allow us to pick deeper into brains of the best in the business and engage with their ideas. An atmosphere conducive to personal growth is one of our much prized values, after all. Out of the whole fray of books I ran through in 2018, a couple of business-related positions truly stand apart. What probably separates them, is how often we used them in actual office discussions, and how many times they popped up uninvited in different circumstances. This suggests to me, that there must be some staying power with what they are preaching. After some time, our trainers have used those titles to enhance their workshops, and we used insights derived from their pages to help our clients directly. On top of that, business books can be a bore. Three ones below were definitely not. To the point – here are the books you simply need to read for your own good. When in 2017 I saw on the authors LinkedIn profile that a new title is in the making, I knew that it will land on my reading list pretty soon. Seeing many lectures by Patty before, I expected more of what she is known for – meaningful, business-oriented approach to HR. McCord does not waste paper and does not mince words. Her school, after all, is one of honesty and direct communication with every employee. Powerful takes you back to the early days of Netflix (where Patty was a Chief Talent Officer), when streaming was still in its infancy and the company was essentially selling DVDs. Patty’s lessons became very important in this period, where change was necessary to adjust to a constantly churning environment. Netflix started its climb towards an industry powerhouse by smart hiring choices that fit into an overarching culture that was more than empty slogans. This is a great book of choice for leaders who want to build high-performance teams, that consist of people who love their job and prize having real responsibility without senseless bureaucracy. It is a short, but densely packed manual filled with challenging questions that there may not be a one-size-fits-all answer. Food for thought! 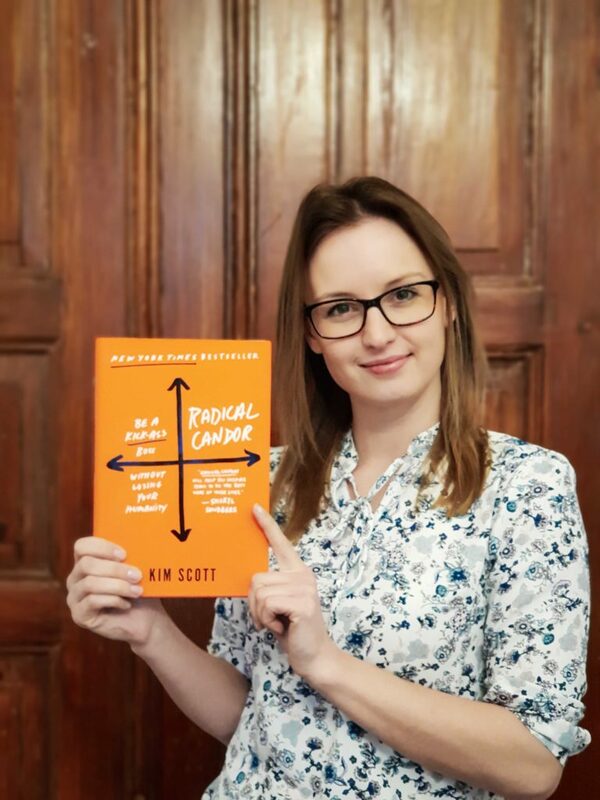 Radical Candor is quite popular in our office library! You may be the nicest person on the planet, but being a teammate or a superior may require you to communicate some harsh truths to others. Many of us struggle with difficult and honest conversation in our private lives. Unfortunately, professional environments are not necessarily more welcoming. Kim Scott explains with, well, tremendous honesty, why candor with your teammates pays off in the long run. Beating around the bush, not trying to differentiate opinion from facts – vices all underwritten by numerous examples straight from Google offices. From day one our employees at Bee Talents are encouraged to be honest with each other. We simply don’t believe that feedback is a one-way street. Nobody should be immune from well-intentioned and well-structured criticism! This is a key to any improvement – awareness of the issues. That’s why I recommend Radical Candor reading for all the CEOs out there, who should never avoid a reality check from their subordinates. This book was recommended to me by Miłosz, CEO of Appchance when we met for lunch and talked business strategies. Scaling Up is a motherlode of ideas, and it opened up previously unseen possibilities. Thanks to this book, I came to truly realize how much work needs to be done for us to become a top echelon company and realize all our goals. People, strategy, execution, and cash – four pillars that drive the growth of your business. They all go hand in hand and you can’t focus only on one or two of them. But, what is even more important, you and your team have to sit on the same bus and go in one direction (Jim Collins, “Good to Great”). And in order to do that, you have to have a unitary, shared vision of your company. This book has directly influenced how we work, as well. Once a quarter we are having a company-wide sit down called “Scaling up Workshops”. During those meetings we review the state of our organization. This brings clarity as to where the bus is actually going and how fast! This book is available only in English, hard copy and e-book. It’s quite long, but as a bonus, there are some extra resources available on the website http://scalingup.com. Check it out. That’s my subjective top three business books for the year, and I can’t wait to share more this time next season. What is your opinion on them, or what titles would you recommend to me and others? Chime in!